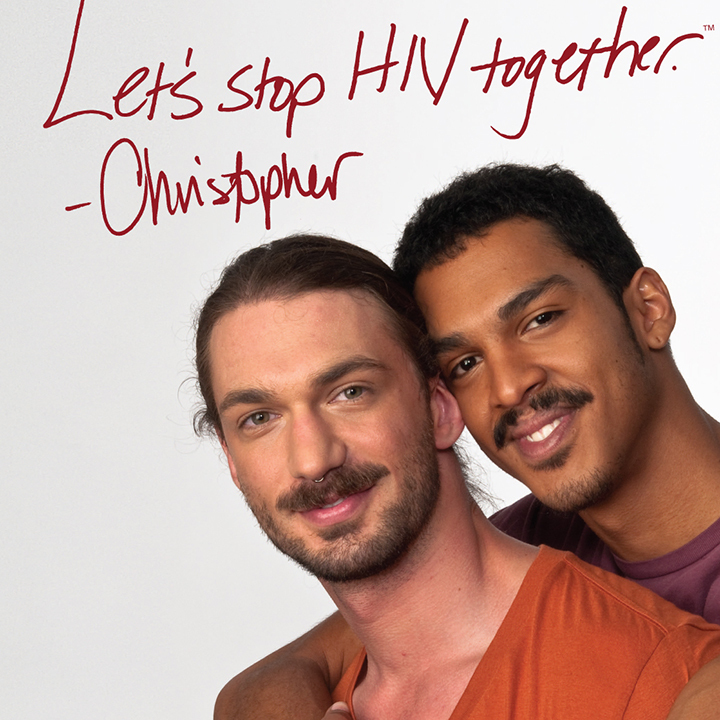 Newspaper readers in a number of Iowa communities had raised eyebrows during the past month by an ad campaign called “Let’s Stop HIV Together” that has featured photos and stories of non-traditional relationships. 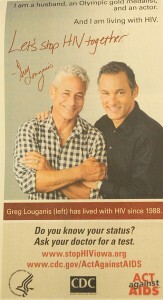 One ad features former Olympian Greg Louganis and reads: “I am a husband, an Olympic gold medalist, and an actor. 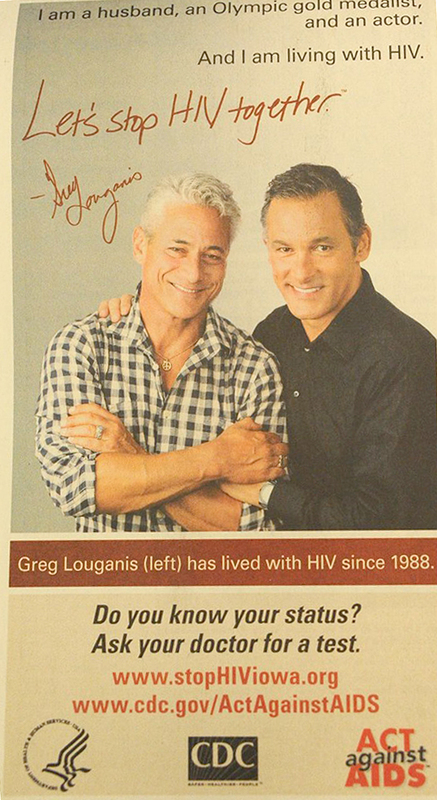 And I am living with HIV.” Louganis is featured with his “husband,” Johnny Chaillot (at right, click to see full size). Although the ad features the logos of the U.S. Centers for Disease Control and Prevention and the U.S. Department of Health and Human Services, it also has the website www.StopHIVIowa.org listed prominently below the photo of Louganis and Chaillot. That’s because, according to the advertising agency arranging for the publication of those ads, they are being paid for by the Iowa Department of Public Health. Bureau of HIV, STD, and Hepatitis Chief Randy Mayer, however, said the state did not handle the ad campaign, saying his office “had nothing to do with it,” although it supports the cause. There are presently a little more than 2,000 HIV-positive Iowans. The website for Stop HIV Iowa indicates the organization is located within the IDPH headquarters building in Des Moines. It also links to the IDPH’s official website, directing to the Bureau of HIV, STD, and Hepatitis page. The Iowa Statesman obtained Tuesday a copy of an advertising invoice for a similar bill that lists IDPH as the advertiser. In the single newspaper identified in the invoice, the cost to run the ad was $365 for two publications. It is not clear if the funding is coming from state taxpayer funds, or from federal grants paid for by federal taxpayer funds. According to the website, however, the Iowa HIV/AIDS program receives HIV prevention funds from the CDC to provide for HIV counseling and testing, partner counseling and referral services, health education/risk reduction activities and health communication/public information activities. Mayer was not in the office or available for comment after the invoice was discovered. Several Iowa pastors responded upon seeing the ad for the first time Tuesday afternoon. Pastor Michael Demastus of Fort Des Moines Church of Christ was surprised at the irony contained in the ad. Legislators in Des Moines who were asked about the ad said they were not previously aware of it. They were provided with copies of the ad, and if they respond, this article will be updated. Iowans for Tax Reform also reviewed the ad, but did not have an official position on the use of taxpayer funds for its publication.